TANDEM SKYDIVES – the ultimate gift! Are you in troubles finding the right gift? 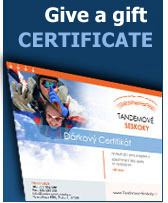 Give a tandem jump gift certificate! You will present the gifted person with not only a great deal of adrenaline, but also a memory they will keep for the rest of their life. You can purchase our tandem jump gift certificates in our pick-up office or we can send it to you within 1 day via collect on delivery mail. Iveta Bartosova jumped with us in a tandem in Pribram. She was afraid, but as she told us, it eventually came to be one of the most beautiful experiences in her life. NEW – tandem jumps in Most! We have just signed an exclusive contract with the airport of Most, which became the only airport in North Bohemia where we offer tandem skydives. New airplane, PAC – 750, which was engineered to suit the needs of skydivers, will take you up to 4200 m, which you cannot get at any other airport in the Czech Republic! Tandem jumps + 11 airports in the Czech Republic! A two-day training is finished by one or as many as three solo jumps from 1200 m. You will jump a ram-air "square" canopy, which is activated automatically by a static line. A perfect introduction to skydiving. The course is designed for complete beginners. Accelerated FreeFall course – AFF. The state-of-the-art method to become a qualified skydiver. We have vast experience in training absolute beginners as well as couching the national representation team. We skydive every weekend as well as on weekdays. Tandem jumps are done in Pribram, Most, Horovice, Kolin, Kunovice and Prostejov. We will skydive with you in other locations in the Czech Republic by mutual agreement. You can find more information about each airport after clicking at it in the menu on the left.